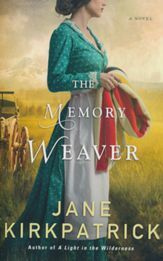 Based on true events, The Memory Weaver is New York Times bestselling author Jane Kirkpatrick's latest literary journey into the past, where threads of western landscapes, family, and faith weave a tapestry of hope inside every pioneering woman's heart. Readers will find themselves swept up in this emotional story of the memories that entangle us and the healing that awaits us when we bravely unravel the threads of the past. Buy the book HERE.